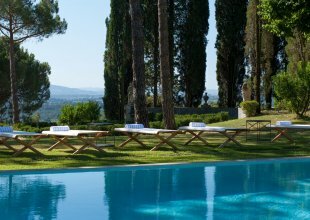 The very pretty Giuliana is a wonderful Tuscan farmhouse set amidst lushly ordered vineyards and picturesque olive groves in the heart of Chianti Classico. 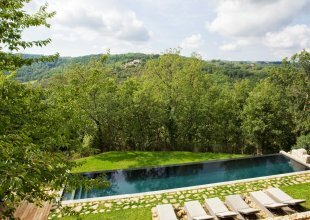 The views are magnificent all around, the property itself superbly well set up and the location is very special, close enough to Florence to make Brunelleschi's Duomo and the city's magnificent Renaissance sights within easy striking distance. Furthermore all around are some of the classic medieval hilltop attractions of Chianti - villages like San Gimignano, Castellina and Greve with their roughly hewn ancient walls and mazy cobblestone streets, full of cafes, shops and enoteca, wonderful for exploring and tasting the gastronomic delights of this world-famous region. The heart of the home is a spacious and fully equipped kitchen, ripe for trying newly acquired local recipes and some of the delicious local wines. The ground floor has two living rooms, a bedroom and a delightful dining room which opens up onto the lawns and extensive gardens. There is also a second kitchen often used for breakfasting. On the first floor are four further bedrooms and another living room. Across from the main house there is a nicely converted barn with a large open room with living space, fireplace, a kitchen and bathroom. Upstairs is a further bedroom.